THE secret extremes of the state's obesity crisis have been exposed. The endocrine team at Lady Cilento Children's Hospital has brought to light the tragic case of a nine-year-old Queensland boy weighing 178kg. 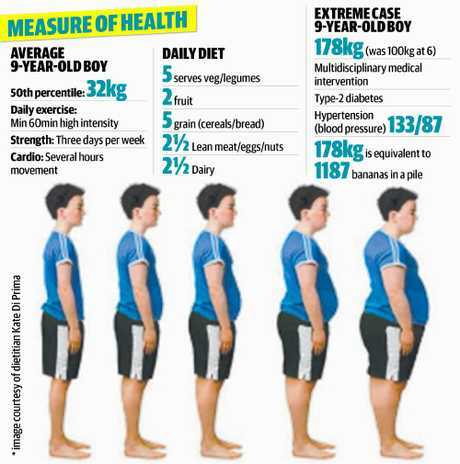 Clinicians at a presentation on type-2 diabetes in children heard that at just six years old the child weighed 100kg and by seven his BMI was 50 - a BMI of 40 is classified as morbidly obese. 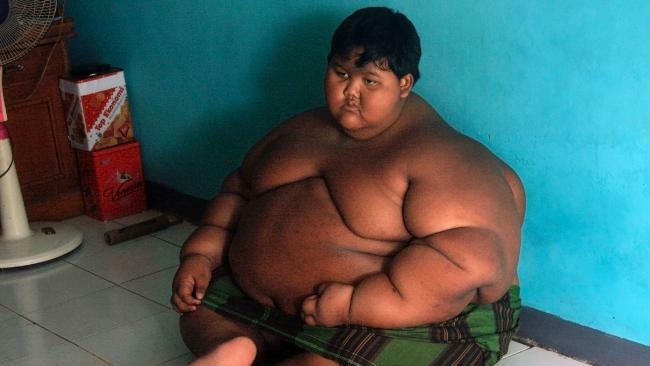 This local case is on par with Indonesian boy Arya Permana, who was named the world's fattest child at 10, weighing 192kg. While metabolic and endocrine problems can add to pediatric obesity, and all the health issues of this unidentified boy are unknown, the state's top doctor says it is a sad reality that many of our children are carrying way too much weight and just over a quarter in Queensland are overweight or obese, and some morbidly obese. 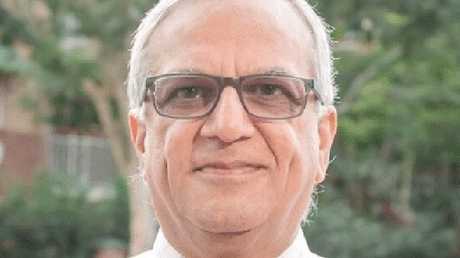 Australian Medical Association Queensland president Dilip Dhupelia urges parents to take their children to a regular GP who can monitor and record growth and BMIs. "Any significant deviations can be acted upon earlier than later," Dr Dhupelia said. "When children eat more than they need, their bodies store extra calories in fat cells for use for energy later. "If they do not use this stored energy they develop more fat cells and may become obese." Brisbane accredited dietitian Kate Di Prima has a special interest in pediatric and family nutrition. She says that Queenslanders are in the grip of "body distortion" and parents are often stunned when they see how their child measures up against a healthy weight. "Over my years in practice, I have seen kids get bigger and bigger but often parents just don't see it. If the child is compared to the rest of the family they may look small," she said. But the dietitian says there is always a way back for kids who are obese. "It is not hopeless. Families can get support and make significant change," she said. Life has turned around for world famous Arya Permana, who has lost an amazing 83kg after gastric surgery followed by a strict diet and exercise regimen. He is now able to play with his friends. "Obesity in childhood causes a wide range of serious complications and premature illness like diabetes and cardiovascular disease," Dr Dhupelia said. "The children are at risk of joint problems and sleep apnoea. Obesity causes adverse lifestyle factors, like physical inactivity, excessive intake of calories over and above what is required for the low activity and lower quality of life. "From the mental health point of view, the children are at risk of low self-esteem and stigmatisation." The 2018-19 Queensland Health budget outlines a plan to launch the Healthy ­Futures Commission - an initiative to help turn around the horror numbers that show that one-quarter of children are obese or overweight. The latest Queensland Chief Health Officer's report shows less than half of children are active every day and one third exceed the recommended maximum screen time. Professor Jerry Wales, director of endriconology and diabetes at LCCH told The Courier-Mail that he could not comment on the unnamed Queensland boy's case. "It is important to remember that genetics often plays a part in these kind of cases," he said. The professor said the youngest child he has treated with type-2 diabetes was a British child who was eight. This unidentified child is nine. The number of Queensland children under 18 diagnosed with type-2 diabetes has jumped more than 72 per cent in just under four years. 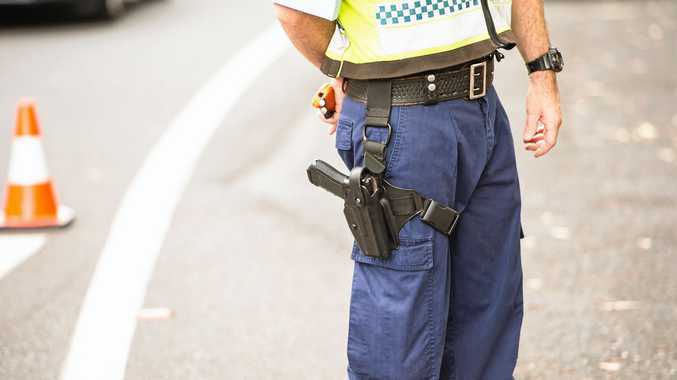 Diabetes Queensland chief executive Michelle Trute said the rise was of particular concern because the onset of type-2 diabetes could be prevented or delayed in 60 per cent of cases with healthy eating and an active lifestyle. Dr Dhupelia urges parent to lobby for change. "We need to counter the increase in availability of energy-dense, high-calorie, poor nutritional value food and drinks, even in schools. We need to ask governments to intervene to restrict ads for fast foods, soft drinks and high sugar content cereals during kids TV viewing times. "Vending machines should not only contain chocolates, potato crisps and high sugar soft drinks. "Leading by example as far as increased regular physical activity, high-quality diet and maintaining normal weight themselves. Limiting the occasions of takeaway meals, restaurant treats and the purchase of pre-prepared meals." OUR obesity crisis needs a two-pronged approach. Early intervention is the key, but what about those that are already well and truly weighed down in cumbersome bodies and firmly stuck in the world of the obese? Almost 73,000 Queensland children are seriously overweight. Money needs to be pumped into helping these children who may have given up on themselves. More family weight-loss clinics with prolonged support would be a good start. What a child eats begins at home, but many parents are super busy and have lost their way. Blaming and shaming them simply compounds the problem. The report of a 9-year-old Queensland boy hitting the scales at 178kg is heartbreaking. The boy has type-2 diabetes and hypertension. It is unknown if he has unique endocrine or metabolic problems, but regardless, this is a boy in desperate need of extended and compassionate health care. He is very fortunate to be in the hands of the state's top doctors. Every 9-year-old boy has a talent and a dream. Some are naturally funny and can make people laugh, others have golden singing voices. Imagine if those talents never had the chance to take life because all hopes were deeply buried inside a shell that was difficult to even drag across a room. This boy, like every other little boy, deserves to live out his boisterous youthfulness. It is heartwarming to see that the Indonesian child, who was labelled the world's fattest child at 10 years old, has lost a whopping 83kg from his 192kg frame. As dietitian Kate di Prima says, "it is never hopeless".